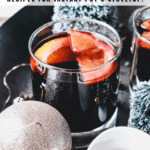 The coziest of holiday drinks, mulled wine (or glühwein) is super easy to make in an Instant Pot or on the stovetop and makes for a perfectly spiced, warm Christmas drink! 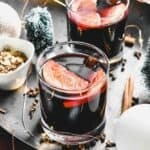 Have you ever had glühwein? If you’ve hung around with any Germans around the holidays, I bet you have. And if you hang around with Nordic folk, you may have heard it called glögg. And if neither of those rings a bell, I’m sure you’ve heard of mulled wine. It’s probably my favorite part about Christkindlmarkt. 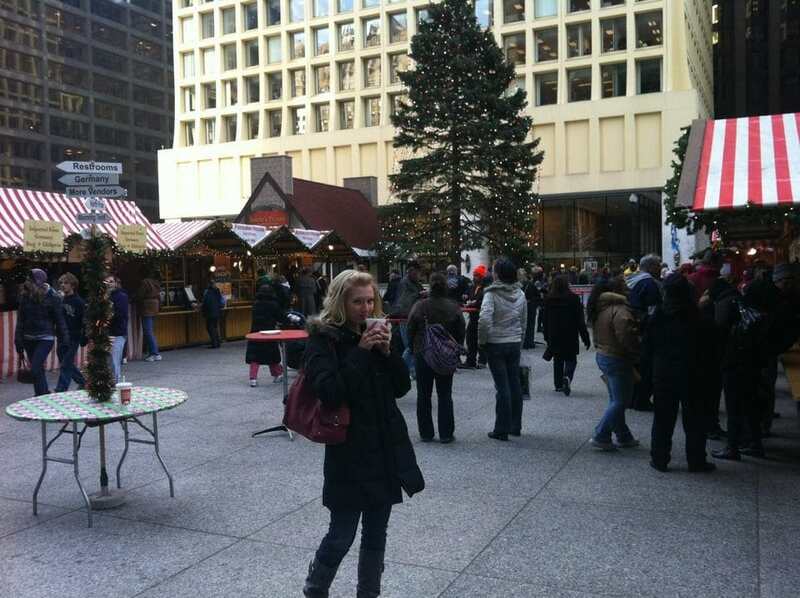 When I lived in Illinois, I used to go to the one in Chicago every year (after I turned 21, of course) and my first stop was always to get glühwein. Followed immediately by bratwurst, stuffed pretzels and marzipan candy. 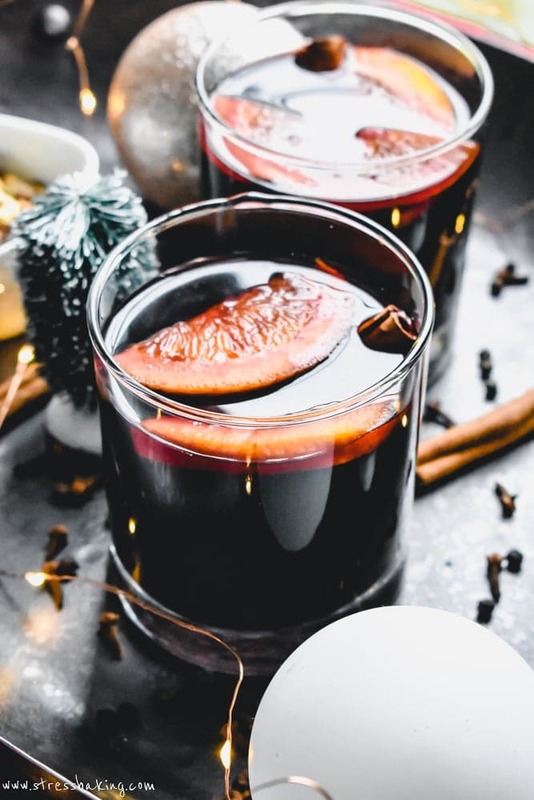 The scent of mulled wine is so damn comforting. There’s something about this particular combination of spices being warmed with red wine that just makes everything cozy. The aroma fills the house and becomes this amazing natural air freshener that requires no plugins or chemicals. 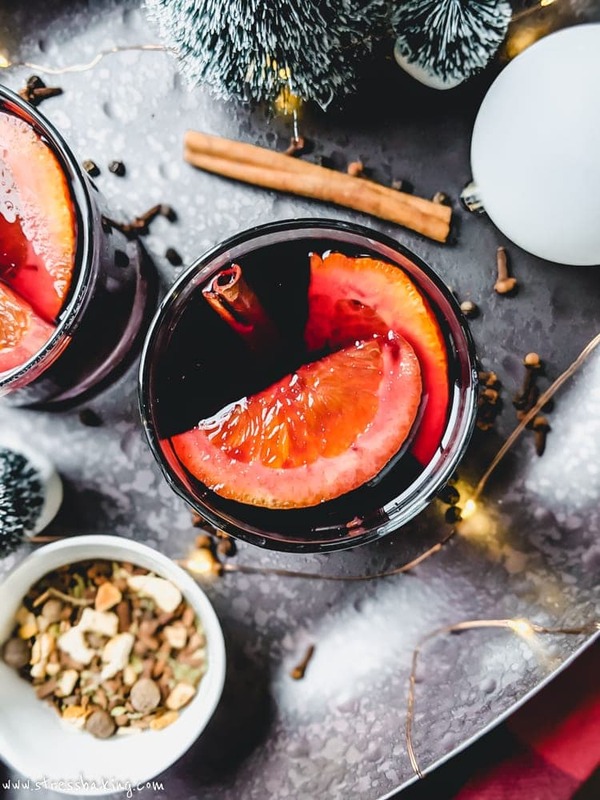 Sure, it fades eventually, but that just means you’ll need to make more mulled wine. OH DARN. WHATEVER SHALL WE DO. I always like to make things from scratch, I also like to make things easier when I can. This is where a spice blend from a local farm comes in super handy! 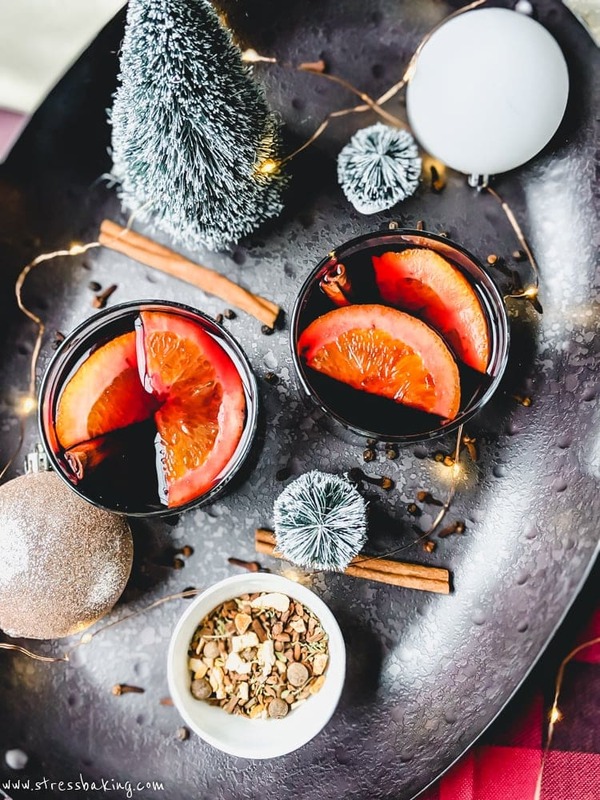 I highly recommend having a tin of mulling spices on hand so that you can throw together a batch of mulled wine at a moment’s notice when guests stop by. I know we live in a time now when people stopping by unexpectedly causes the urge to turn off all the lights and hide in the closet until they leave, but let’s shove that deep down and welcome people into our homes this holiday season, shall we?! This batch was made with a tablespoon of fresh mulling spices from Soluna Garden Farm in Massachusetts. We’ve gotten spices from them before at their stall at the Boston Public Market (one of our favorite places to shop local), and they’re absolutely delightful. Their mulling spices are no exception. Don’t have a local vendor nearby? Your grocery store will likely have something in the coffee/tea aisle, so mosey over there and give it a look. Wait… have I seriously not mentioned anything about the fact that this is made in an Instant Pot yet?! Good grief, Charlie Brown. 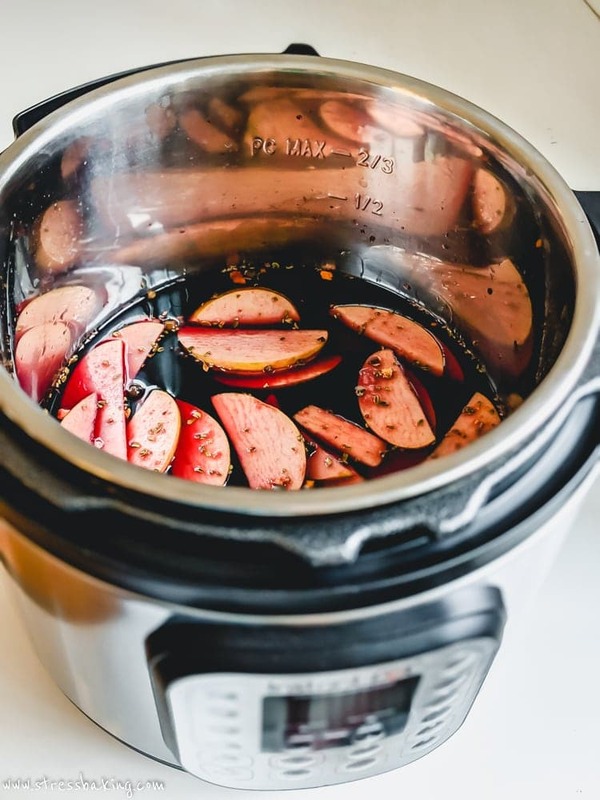 So, this is my first Instant Pot recipe on the blog because a friend was kind enough to gift Bill and I with one at our wedding shower/housewarming party a couple weeks ago. I’ve been mulling over what recipe to post first (GET IT?) and decided this was perfect. 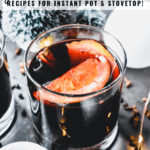 No muss, no fuss, and if you don’t have an Instant Pot this is just as easy to make on the stove top. I’m a big fan of drinking glühwein mit Schuss, which means that I add another liquor to the mix. My personal favorite is brandy, but you could experiment with your favorite rum as well. When serving, I like to add a couple orange slices to mine and call it a day, but you can add cinnamon sticks, fresh cranberries, star anise, apple slices… really, whatever you want. Also, quick note: Those apple slices that were in the pot with everything? They become these ridiculously delicious boozy apple slices. I recommend not discarding those. Combine all ingredients in the Instant Pot and set to cook at high pressure for 1 minute. Note: When you set your IP to cook, it will have a preheating period and then will automatically begin to cook at the time you set when it’s ready. Using an oven mitt, carefully turn steam valve to release all the pressure. If you prefer not to have the spices and apple slices in your drink, just pour the mixture through a fine mesh sieve before serving. Serve with orange slices, apple slices, cinnamon sticks, and/or star anise and enjoy! In a large pot on your stovetop, combine all ingredients and simmer over low heat for about 15 minutes (don’t let it boil!). Use fine mesh sieve, if desired, and serve. This looks party perfect. The guests can help themselves all night long. Perfect for the holiday season. CHEERS!! Love ALL the flavours happening in that pot. I haven’t had mulled wine in years!! Lucky me I have a brand new instant pot and looking for ways to use it. Oh yes!! 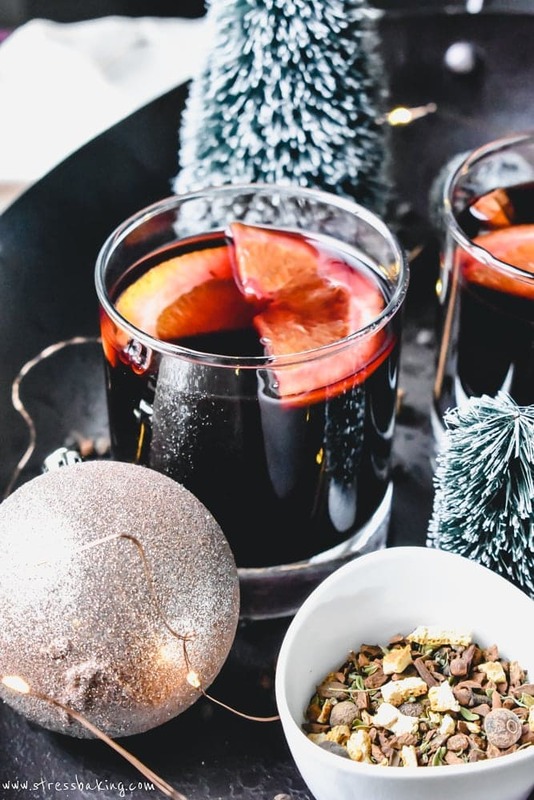 I absolutely loved mulled wine this time of year. Even better that its made in the instant pot! I bet it makes your whole house smell just amazing! 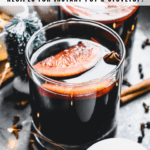 I have to say I never thought about the instant pot for a mulled wine. What a great idea. 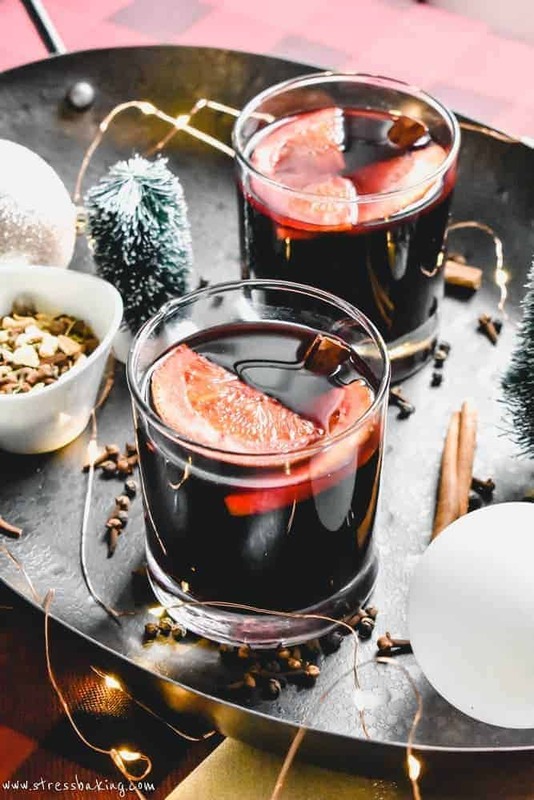 When I think if thus warmed drink my body relaxes and the memory of that amazing aroma of wine mulling with all those spices brings me back to the Christmas Spirit. Great idea. I have heard the Instant Pot is great at making drinks. I just got one and I have been searching for recipes to make for the holiday season. This will be perfect for our family Christmas party! 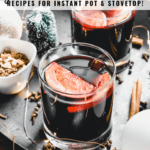 What a intresting recipe using instant pot. A perfcet holiday treat. Love the flavors here. 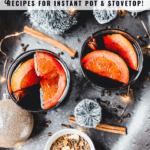 I love that you used an Instant Pot to make this! I would have never thought to do that! 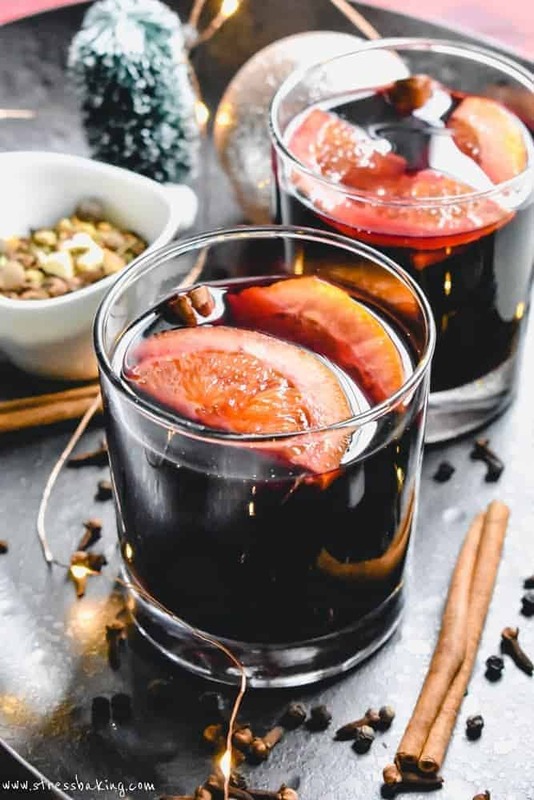 I’ve never had mulled wine -looking forward to trying this! This is my kind of drink! We happen to have mulling spices, so you bet we’ll be making this recipe this holiday season! Thanks Leslie! This drink looks so festive! 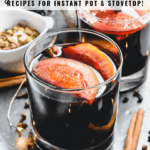 It’s so creative that you used an instant pot to make this, I have never heard of that. ! don’t drink but I have a few friends who would love to check out this recipe, sending over the link to them now!! This brings me right back to my childhood! The one time of the year us kids could have ‘wine’…my dad would make a batch of it and then we’d all sit around, decorate the tres, and sing Christmas songs. Recipes like this that invoke childhood memories are simply the best!